Please see pdf above that also includes the Chinese version. Based on your professional backgrounds, how do you create successful projects as a team? Tomi Vollauschek (TV): Agathe and I met in London on the Royal College of Art's (RCA) postgraduate Communication Art and Design course in 1999. Before that Agathe obtained her diploma in Paris (Academy Julian, ESAG) and I in Germany (FH Darmstadt). 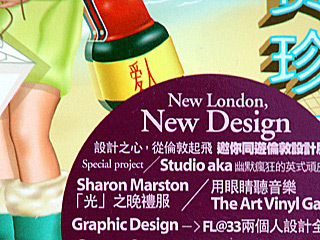 We set up FL@33 in London after graduating there in July 2001. 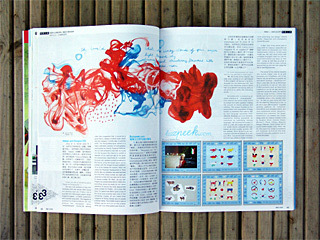 ...background and it used to be easier for me to create intriguing new layouts. Nowadays – over five years after setting up our studio – I have to say that we learned a lot from each other and we now do pretty much the same things even though we might be better in certain software packages than the other one. TV: We were commissioned in 2002 - only eight months or so after we set up FL@33 - to create three seasonal Brochure covers and images for posters, brochure dividers and leaflet covers for the Royal Festival Hall Classical Music campaign 2002/03. 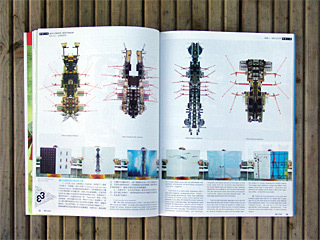 Their Art Director of the in-house design studio saw our self-initiated, self-published Architecture, Art and Design publication Trans-form magazine. ground (with our heads in the sky) and created and animated crawling cityscape insects with tower crane legs. The publication includes photography, photomontages, line drawings, typography, animations and lots of information on how tower cranes work, etc. So all this was presented by the Royal Festival Hall's Art Director to their marketing department who needed to be convinced that people who can make tower cranes look exciting and beautiful could do the same to promote classical music... We were really excited about this commission. 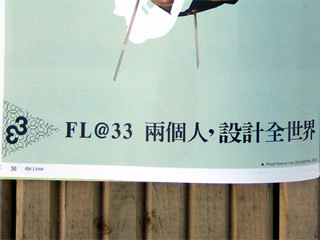 ___ Not only did a big client approach us for the first time because they saw another FL@33 project but we could also work in a way we wanted to. Agathe and I were responsible for taking pictures of bizarre medieval instruments with real-time explanations of their owner, all kinds of musicians in action and the design itself - the creation of surreal, intriguing and inviting imagery. The images were created in a ping-pong fashion were Agathe would start a composition, I would then add elements and Agathe would finish it after a few back-and- forths - or the other way around. ___ AJ: Today we have altogether more work and possibly slightly less time on our hands than 5 years ago but at the same time we became more effective and professional I guess. The process itself didn't really change though - we still try to find the most appropriate visual language, technique and - if we have the choice: the medium itself - for each individual project. Could you please comment on the fact that T-shirt graphics become increasingly popular? T-shirts were the reason why we set up our sister company stereohype.com. Stereohype.com is an online boutique offering limited editions and rare products. 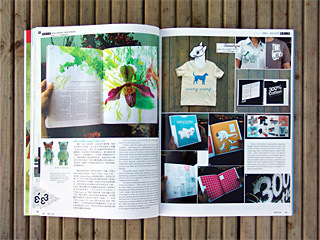 The Stereohype range is focusing on fresh, innovative and inspirational works and expands regularly. Products include exclusively commissioned artworks for Stereohype. Stereohype.com is a platform for designers and artists around the world. Regular competitions give emerging and established artists, illustrators and designers the chance to promote their talent and to get their artworks produced and featured. are announced via our website, mailing list, international magazines and link portals. ___ The idea for Stereohype started when we were working on the book design of 200% Cotton - New T-Shirt Graphics by Helen Walters and published worldwide by Laurence King Publishing (and their partners) back in early 2004. Our first ever T-shirt designs were also featured in this book and we felt encouraged to create our own label and online shop. Initially we were thinking about an official FL@33 shop but quickly decided that it would be more enjoyable for us (and our customers) to create a platform for other designers and artists too. When we came up with the name 'Stereohype.com - graphic art and fashion boutique' we deliberately chose not to tell everybody that it was a FL@33 project. ___ After a few articles in international magazines though it became clear that we could not and in fact should not keep it a secret anymore. Anyway – got carried away there. The FL@33-designed sequel 300% Cotton – More T-Shirt Graphics is due to be released this autumn and is including our Stereohype collection 2005/06 besides many international T-shirt gems. T-shirts do certainly seem to be more popular than ever fueled by the ever increasing amount of independent online shops set up and run by artists and designers themselves who are offering great tee designs to a global customer base. Could you tell us something about 'Design and Designer 033'? 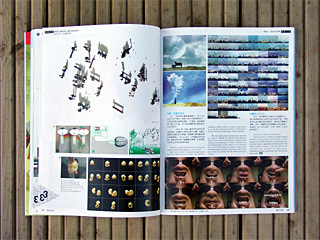 We had a solo exhibition in Paris from December 2004 until January 2005. During the opening night we (finally) met a journalist from Paris-based graphic design magazine étapes - a FL@33 collaborator and supporter since 2001. 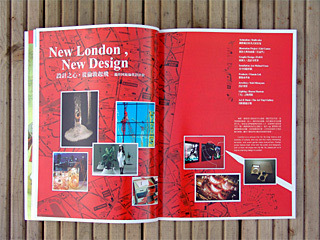 The magazine is published by Pyramyd Editions who also produce the monograph series 'design&designer'. During that opening night they suggested that it would be a good time to release a FL@33 book which was then released 7 months later in summer 2005. The Design&Designer series is a highly-collectable collection of monographs, hand-picked by French Pyramyd Editions. And we were amazed to hear that we would not only be given the chance to publish a selection of our work but also to be given the extraordinary opportunity to re-publish the book with updated content sometime in the future using the exact same series number with the straight-forward addition: v2 or v3 (to indicate the version). When we visited the Pyramyd Headquarters in Paris shortly after our exhibition we were told that the most likely series number we might get would be number 34 if we were not to hurry to secure number 33. Well – as you can imagine we worked extra hard to make sure everything would be ready by our given deadlines to secure the most appropriate series number for FL@33… It’s a nice little book. It's great to be able to give a copy of the book and possibly also one of the remaining copies of our Trans-form magazine to family, friends and of course potential clients. The FL@33 book is also a fantastic way for us to put our first projects aside, get it out of the system and move on. 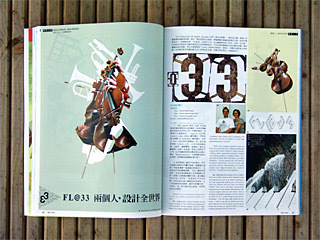 In visual communication art, what is your new discovery recent years? TV: The power of the internet. We really enjoy working on two self-initiated FL@33 projects we learned a lot from: Bzzzpeek.com and stereohype.com - two more or less interactive projects which help us to network a lot and by doing so we get to know plenty new interesting people. ___ Bzzzpeek.com is presenting an online collection of 'onomatopoeia' from around the world using sound recordings from native speakers imitating the sounds of mainly animals and vehicles. This project focuses on the pronunciation and comparison of these sounds by presenting them side by side as each language expresses them differently. Bzzzpeek.com is an interactive experience inviting everybody to contribute by submitting missing languages. We launched the project in 2002 as a little side project and didn't in our wildest dreams anticipate the huge interest we could possibly generate with this website. 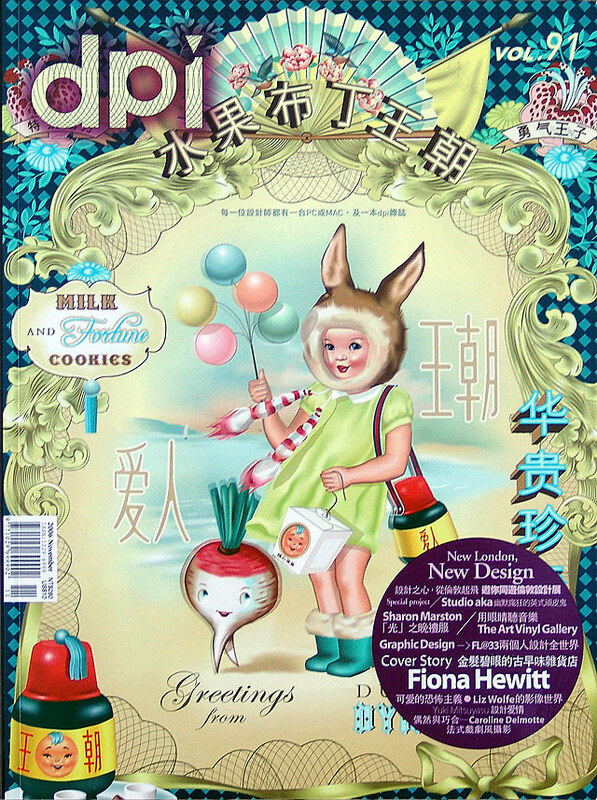 Since its launch we won numerous international awards for it, on- and offline, had several radio interviews and had major articles in design and even more surprising non-design related books, magazines and newspapers around the world. ___ A New York Times article back in June 2005 for instance catapulted our daily visitors to bzzzpeek.com from approximately 2,000 to 15,000 every single day. We very much enjoy that complete strangers read our call for sound submissions and send us their kids' voices as mp3 files via email. It also amazes us that so many schools approached us who are now using the site for teaching purposes. ___ The power of the internet became very quickly crystal clear to us and bzzzpeek.com is probably one of the reasons why we launched our graphic art and fashion boutique - stereohype.com about 2 years later, in October 2004. We set up Stereohype as a possibility to sell our very own FL@33 products such as Trans-form magazine or our Mr Papillon 2" Kit Cat Qee directly to customers around the world. Our second clothing range (mostly T-shirts) has recently been launched and we have now increasingly added other people's work too - an idea we were toying with from the very beginning. Stereohype is now - a bit over one year after its launch - a quickly growing platform for numerous, international and emerging talents and more established artists, designers, illustrator and collectives. Our design initiative B.I.O. (by invitation only) button badge series for instance includes works by Vaughan Oliver, Deanne Cheuk, Michael C. Place, 123klan, Megumu Kasuga, Delaware, David Foldvari and of course FL@33 besides many others. We are also organising design competitions and encourage students to enter their works for possible selection and of course nice prizes. What do you think about London as a city and creative location? What appeals to you most? ___ AJ: Tomi's French is not good enough yet to even think about moving to Paris. Our common language is English, London is where we met and set up our studio and last but not least we simply love to live and work in this multi-cultural, vibrant metropolis. ___ TV: We certainly were impressed when we came to London in 1998/99. The general public seems to have a much more evolved design awareness than anything we experienced in France or Germany. We had approximately 40,000 visitors at our final year show at the RCA. People were actually cueing in their hundreds to get in during our private view. We've never even heard of anything like that before coming to London.